To make the lampwork bead necklace you need three lampwork beads. These are oval lampwork beads. The size is 15 millimeters by 30 millimeters. Then you'll need 16 round faceted beads. These are peach, and they're eight millimeters. We have four faceted rondelles in black, six millimeters by ten millimeters. Four faceted oval beads, also in black, eight millimeters by ten millimeters. And four faceted rondelles that are a little bit smaller than the other ones. They are five millimeters by eight millimeters, also in black. Delica seed beads, and they're kind of a black oil-slick, fire-polished color. For bead-stringing wire, we're using 19-strand bead stringing wire in gold. You can see the gold finish here. And then we have crimp beads. We're using #1 size crimp beads, and we have two of them. But we've got them in a little tube because otherwise, they'd be all over the place. Then we've got two clamshell bead tips and gold, and a toggle clasp also in gold. Then we have a Bead Bug and this is optional. For tools, we have chain-nose pliers and wire cutters. we're gonna figure out the design of our necklace by laying out our beads in a pattern. And we like to start with a focal bead first, which is this beautiful lampwork bead. we actually took the lampwork bead around the bead show with us and picked out these gorgeous peach beads and these black beads. lampwork bead, and then I'm just gonna make a little pattern using the peach beads. I think we'll do a peach bead in between each of our black beads. a small rondelle between those two peach beads. a smaller size. And then we'll do our large faceted rondelle next. we're gonna put three of our Delica beads. And that's going to create give it a little bit of space between the beads and add a little shine and color. I'm gonna take a Bead Bug and put a Bead Bug at the end of the bead-stringing wire. you could take a piece of masking tape and just fold it over at one end of your bead-stringing wire. Then I'm gonna take the other end of my bead-stringing wire, and I'm gonna start beading. So we'll start with our Delica beads. And we're going to put three Delica between each of our beads. And I like to put them in the palm of my hand. kind of by tipping them on to the wire. So there are three Delicas. then again, we'll do three Delicas. and also it's gonna add a lot of shine, which I think is really nice. We chose Delica beads instead of regular round seed beads because we like the way they're cut. They sit right next to each other. They almost look like a bugle bead, which we just think is interesting. So that was our large rondelle. followed by three more Delicas. too because it really does look a little bit like an oil slick. we're gonna do our oval bead. I call it it torpedo bead but really it's an oval bead. Then three more Delicas. Oops, I only have two in my hand, so I'll grab a couple more here. Followed by another peach bead. Once you get the pattern going it'll go very quickly. you really just string all the beads in that order, and it's as simple as that. And I'm going to look and see where we are. So this is reversed. I'm going to reverse it so you can see it. So this is how our beads are looking so far. So now we just have our lampwork bead, and we're ready to repeat or pattern. all the beads and all the Delicas are on my bead-stringing wire. Then I'll show you how to put on the clasp. I finished stringing all the beads onto my bead-stringing wire and now I'm ready to show you how to finish the ends. And to do that, I'm going to start with the end that doesn't have the Bead Bug on it. And I'm going to take my clamshell bead tip, one of my clamshell bead tips. then a loop at the top, and I'll show you what all of that does for us. feed it on to the bead-stringing wire like that. And I'm not going to let that fall all the way to the end this time. my clamshell bead tip in place and not let the beads slide off. crimp bead where I crimped it. when you close one of these, you want to close it gently because it's hollow. the little side, so just give it a gentle squeeze. It'll bend really easily so you don't have to use much elbow grease for that. and I'm gonna slide it onto the open loop that's on my clamshell bead tip like that. but if you're worried about it, you can do that. Now we're going to do the same thing on the other end. the end of the bead stringing wire up through the clamshell bead tip. Let it fall down by the beads. because I want to crimp it as close to my beads as possible. crimp the crimp bead. It's a little bit tricky because you're working in tight quarters. But just make sure you've got it nice and crimped on there. trim that piece of wire. Just be careful not to cut your clamshell bead tip while you're doing that. Like that. my clamshell bead tip closed just like I did on the other side. 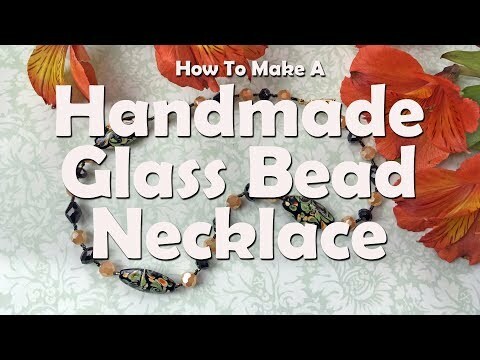 there we have a beautiful handmade glass bead necklace.